Converse shoes are a staple and, besides a few minor changes over the years, have stuck with the white toecap and (traditionally) black shoe. However, the brands new “Flyknit” sneakers are a brand new look for the classic shoe. Called the “Chuck Taylor All Star x Nike Flyknit,” it’s the first time Nike technology has been incorporated into Converse footwear since its purchase of Converse back in 2003, reports Refinery29. Check out the brand new design below! According to Nike, the brand embarked on a four-year mission to create the knit technology and precise placement of “support, flexibility and breathability,” creating a featherweight, form-fitting shoe. The shoes are going to run a little bit more than your classic Chuck Taylor—a $110 price tag to be exact. But they’ll be available in six different colors: Green Glow, Indigo, White, Black, Wolf Grey/Cool Grey/White and Red. And they look extremely cool. But this isn’t the first “new” style of Converse that we’ve seen. 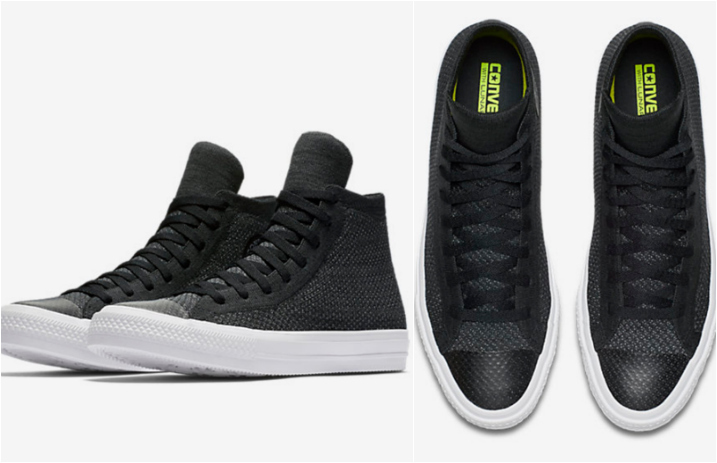 Last fall, Converse released waterproof shoes with a neoprene inner sleeve for warmth and comfort. And, of course, let’s not forget the Converse made with a guitar pedal. The Flyknit sneakers are set for an April 27 release, and you can get a sneak peek of them (with a countdown) here. Are you going to be picking up a cool new pair of Converse? Let us know in the comments below!